It’s not enough for the world to go digital – it’s going mobile too in this new Kindle release, free for the next 24 hours to meet the holiday demand; Amazon’s new Kindle Fire continues to fly off the shelves and boasts many new features and advances in the world of mobile e-readers, but discovering how to navigate this handy little handheld device can make one wish their new toy was literally on fire. 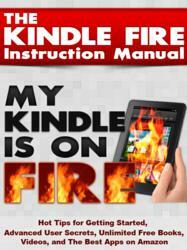 The Kindle Fire Instruction Manual: Hot Tips For Getting Started, Advanced User Secrets, Unlimited Free Books, Videos, and The Best Apps on Amazon, is the best little guide for the Kindle on the market and is free today exclusively Amazon.com. It’s not enough for the world to go digital – it’s going mobile too. One of the hottest new devices on the market has a name to go with it. Amazon’s Kindle Fire boasts many new features and advances in the world of mobile e-readers, but discovering how to navigate this handy little handheld device can make one wish their new toy was literally on fire. Thankfully Silver Bullet Books has teamed up with author and techie Paul Alfonsi to help Kindle owners unlock the door to a whole new world. Filled with useful advice as well as secret tips for how to load your Kindle with free books and apps, The Kindle Fire Instruction Manual: Hot Tips For Getting Started, Advanced User Secrets, Unlimited Free Books, Videos, and The Best Apps on Amazon, is the best little guide for the Kindle on the market. Paul Alfonsi devotes his work to international business and the up and coming mobile tech industry and lives with his wife and two children in Marin, California, buffering San Francisco. Alfonsi works on several digital startups in the mobile space and spends much of his time consulting companies and numerous up and coming movers and shakers in the digital marketing arena. Alfonsi has a passion for the mobile lifestyle as he travels with his wife and kids several months of the year while writing different technology articles and running his business in the new mobile economy. Furthermore Alfonsi likes to stay grounded with all the changes in the technology world by cooking and staying active by competing in triathlons and reading lots of new books on his new Kindle Fire and Kindle app on his multiple mobile phones. The only thing constant in Paul's life is change so he makes the most of it every day. Alfonsi’s main goal is to help every day people navigate the ins and outs of what he dubs “The Best eReader In The Universe”. The Kindle Fire Instruction Manual is designed to help people who are new to Kindles understand everything that they are capable of doing. The brand new book will be free in digital format for instant download to any mobile phone via the kindle app or on a Kindle device for the next 24 hours on Dec 28, 2012.